A watered-down version of Motorola's 6th-generation Moto G smartphone, the Moto G6 Play is geared towards more casual users in search of a high-endurance budget smartphone -- although it falls short of a spot among the best big-battery phones available. Its biggest con is its apparent lack of NFC (Near Field Communication) compatibility , a technology that was already widely used to authenticate mobile transactions as we were reviewing its technical specs. Moreover, it sports an old-fashioned 5-megapixel-only selfie camera , which at least comes with a dedicated frontal LED flash and a Beautification Mode for removing wrinkles and blemishes . 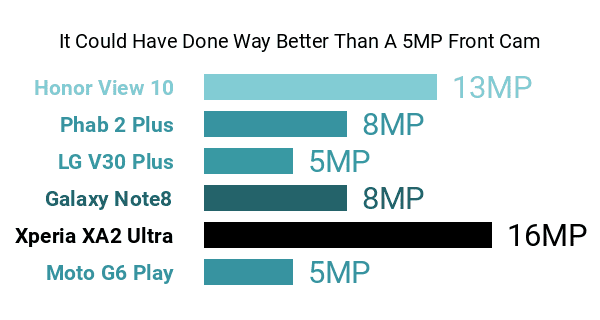 Its pros and cons also include an elementary 1.4GHz Snapdragon 427 quad-core processor , which is a pretty huge drawback, knowing that eight-core smartphones with roughly-similar screen sizes were already all over the place when it hit the market. That said, its 3GB maximum RAM capacity (A 2GB-only version is also being offered) sounds passable, at least versus the lower RAM counts plaguing some of its middle-class competitors. 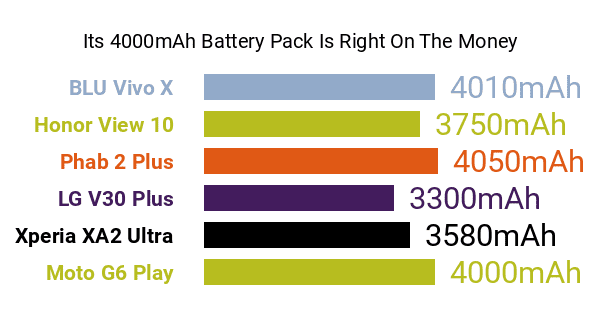 As for its real pros, the G6 Play is powered by a sizable 4000mAh battery cell that is accompanied by a 10W rapid charger and promises up to 36 hours of standard usage on a single charge. It does sacrifice a bit of portability, however, weighing in at 180 grams , whereas the average smartphone weight when it came out was only around 150g. Display-wise, even though its 5.7-inch screen space and 18:9 aspect ratio (Motorola calls it Max Vision) remind us of some of the best phablets on the market, its mere HD+ (1440 x 720) resolution obviously cannot hold a candle to the FHD+ (1080p) and QHD+ (1440p) definitions touted by several other large-screen alternatives. On the rear, it sports a so-so 13-megapixel primary camera equipped with phase-detection autofocus (PDAF) and a Full HD (1920 x 1080) maximum video-recording resolution. Joining its pros and cons is Motorola's signature water-repellent nano-coating , making it ready for accidental spills, and a 3D polymer glass backing . It also comes with a standard fingerprint scanner, a Dolby-enhanced audio system , and a 32GB storage memory expandable by up to 128GB. All said, the Motorola Moto G6 Play could appeal to gamers (ergo, its Play moniker) with its rather spacious display and heavy-duty battery, although a better processor would have been highly welcome as well.